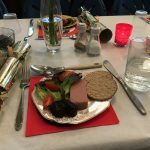 In spite of warnings of blizzards, last Saturday nearly 50 of us gathered for a delicious Christmas lunch complete with all the trimmings, expertly prepared by Clare and her team. 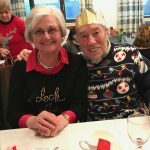 There was a happy, festive atmosphere – including laughter & groans at the corny, cracker jokes! As we drank tea or coffee afterwards giving time for food to digest, we tested our brains on Karine’s 70’s quiz, which certainly tested our memories! Mark’s table came out top after a tie-breaker but their prize chocs were generously shared with everyone. 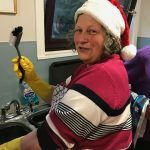 Many thanks go to Clare and her team of helpers. 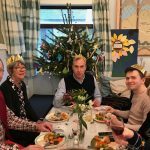 We were very pleased we decided to go ahead as the blizzards never materialised & instead we were able to enjoy fellowship over this special Christmas lunch.